The Denver Nuggets came into Sunday’s game a little shorthanded, but for a good reason. Denver was without normal starters Nikola Jokic, Jamal Murray, and Paul Millsap, who were all resting because the Nuggets clinched homecourt in the first round on Friday. The Nuggets secured that with a 119-110 victory over the Portland Trail Blazers, which is who they faced yet again on Sunday night. Sunday’s result was not as strong for Denver as Portland walked away with a 115-108 victory. With the loss, Denver’s record moves to 53-27, which gives them a .5 game lead over Houston for second place in the Western Conference. The Nuggets got out to a great start on Sunday as they opened the game on a 10-4 run, in large part to eight early points from Gary Harris. With Jokic, Murray, and Millsap all out, Harris took it upon himself to lead Denver on the offensive end of the floor. Trey Lyles followed Harris lead with 10 first quarter points on 4-of-7 shooting from the field, 2-of-3 from behind the three-point line. Even with big quarters from Harris and Lyles, the Trail Blazers still held the lead as they were up 29-25 after 12 minutes of play. 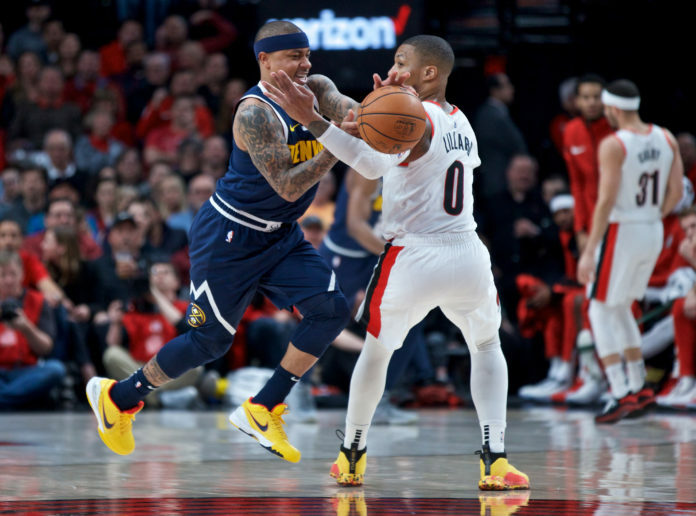 Portland was able to push their lead up to nine in the opening minutes of the second quarter, but Malik Beasley and the Nuggets were still battling possession after possession. Beasley hit a three-pointer at the 6:34 mark of the period, which made it a 43-37 game as Denver was still within striking distance before halftime. From that point on, the Trail Blazers dominated play as they closed the half on a 17-12 run to take a 60-49 lead into the halftime locker room. At the break, Denver was still led by Lyles and Harris, who each had 10 points on a combined 8-of-15 shooting from the field. Those were the only two Nuggets in double-figures at the break, while Will Barton was knocking on the door with seven points. Just as it looked like Portland was going to pull away from Denver, the Nuggets fought back, which was evident in their phenomenal third quarter. Denver went into the period down 11-points and walked out of it with losing by just five as Portland led 86-81 through three quarters. That was because of the play by Harris and Lyles, who continued to carry the Nuggets on both ends of the floor. Through three quarters, Harris had a team-high 18 points, while Lyles was right behind him with 15 points. It was a complete team effort though as Denver had 10 different players that scored at least a point, with Barton and Monte Morris each at nine points through three quarters. The shorthanded Nuggets were certainly giving Portland everything they had, but it was going to take a strong final 12 minutes play to walk away victorious. The Nuggets began the quarter strong, opening the fourth on a 12-4 run that ultimately gave them a 93-92 lead with just over eight minutes remaining. Torrey Craig provided the Nuggets a tremendous spark all night, but specifically to start the fourth as he made a three-pointer and two free-throws to help give Denver the lead. Denver built on that lead over the next few minutes as a Juancho Hernangomez three at 5:14 gave the Nuggets a 104-98 lead. Portland fought back though as they went on a 6-1 run to make it a 1-point game with just over three minutes remaining. That run grew to 11-1 as Portland held a 109-106 lead with 2:16 left to play. The Trail Blazers controlled the final two minutes off play to ultimately walk away with a 115-108 victory. Stat leaders for Denver were Harris, who had a phenomenal night finishing with 18 points on 8-of-12 shooting from the field to go along with two steals on the defensive end of the floor. Lyles was right behind Harris with 15 points on six made field goals, three of which came from beyond the arc. Other Nuggets who finished in double-figures were Isaiah Thomas (10), Craig (13), Beasley (15), and Mason Plumlee (10), who also hauled in 11 rebounds and dished out six assists. Denver now has a day off tomorrow before they play at Utah on Tuesday and then on Wednesday at home against Minnesota to close out the regular season.